At first I planned to dye only cellulose skeins, specifically linen, cotton, bamboo, and tencel (which is made of cellulose from wood, like rayon). 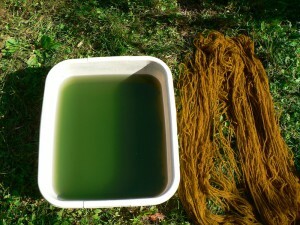 I’ve never tried dyeing bamboo or tencel before, so that was novel. 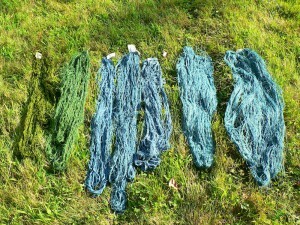 Here are the skeins before dyeing. They’ve been scoured with soda ash and anionic scour, but not mordanted. Very white and shiny. 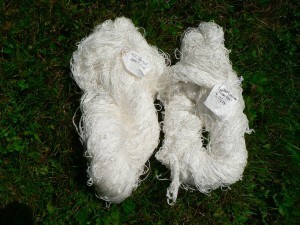 Two of the skeins were 40/2 linen previously dyed with weld back in April. They had been mordanted originally with aluminum acetate, but I did not re-mordant for this woad vat. 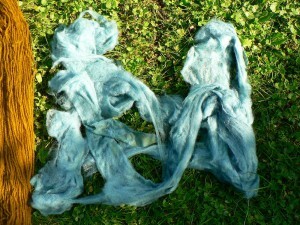 In theory woad does not require a mordant. 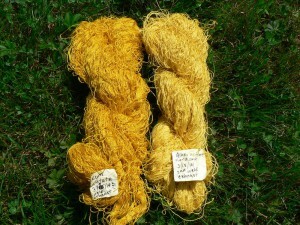 One skein was a very rich yellow, and the other a little lighter. 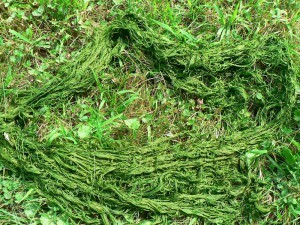 I was hoping for a decent green, at last, after my repeated failures with making green on cellulose yarns. Speaking of which, two of the skeins I planned to over-dye were “not-green” failures from that same series of weld dye baths in April. You can see my earlier post about it here. 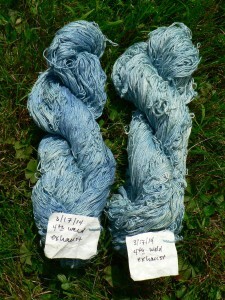 Two skeins were cotton skeins that I’d previous dyed with woad. I was hoping to get a darker shade of blue. I figured that would probably be all I could dye with this batch of leaves. So I set them to soak in a tub of water, and commenced with the vat. Since I’ve posted about my ammonia/hydrosulfite vat process before, I didn’t document all the steps this time. One thing I will mention is that I did short dips, just a couple minutes, and “worked” the fiber in the vat. Instead of just dropping the skeins in and walking away for 5, 10 or 20 minutes, I just dyed one skein at a time. I squatted next to the bucket and manipulated each skein under the surface of the liquid in the vat (wearing heat-resistant gloves). I did this for two reasons. First, I was attempting to keep the strands of yarn spread apart, to allow the liquid to penetrate evenly and to prevent blotchy spots. Second, because I was over-dyeing most of these skeins, I didn’t want the hydrosulfite to have a chance to strip off any of the existing color. A problem with using hydrosulfite or thiox in a woad vat is that both of these chemicals act as a color remover. In fact, the quickie form of hydrosulfite that I use is RIT Color Remover. 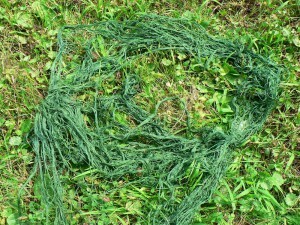 Here is the darker weld skein. Green at last! Grass green, in fact. Despite my manipulation, there are some patches where the yellow shows through, but it looks very lovely anyway. Here’s the lighter weld-dyed skein. It is also very green! Whee! Here they are against a white background, to give better contrast than the grass. The exhaust (lighter) weld is on the left, the darker weld-yellow on the right. 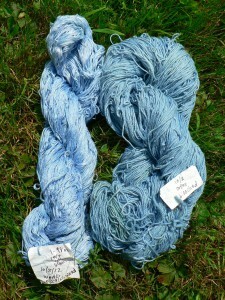 Next I dipped the not-green skeins, and then the light blue cotton skeins. After that, I dipped the bamboo and tencel skeins. Here they all are oxidizing on the grass. At this point I realized there was still a lot of color left in the vat, so I hurriedly grabbed some wool skeins to over-dye. 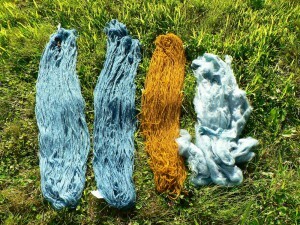 I over-dyed some light blue wool skeins, and then dipped a skein dyed with marigolds during my summer camp in July. It isn’t at all green. I let it oxidize for a while and pondered what might be going on. I decided I’d better see if the vat was exhausted after all, and put in some white roving from Balkey Farm in Northfield, MA. Well, there’s not a ton of color left, but it’s still going. So I re-dipped the marigold skein. Then I let it oxidize some more. 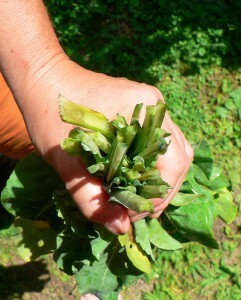 Then I rinsed it to remove any un-bonded woad. The rinse water is on the left. The entire lack of green reminded me of a similar phenomenon during an indigo workshop I took at Vermont Sheep and Wool a couple years ago. I wrote about it in this post in 2012. Two participants had brought yarn dyed with dahlias, which I have never used. They were a nice, slightly orange shade of yellow. 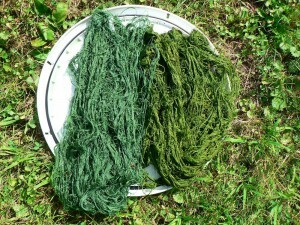 Neither of their skeins turned green when we dipped them in the indigo vat. 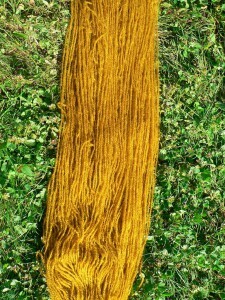 Instead, they turned a very similar rusty brown to my marigold skein above. I still can’t explain why this happened. I’m speculating that it has something to do with pH, but that doesn’t really explain much. More research to be done on this. After the nice light blue on the roving, I decided to sop up the remains of the color with the last of an ancient stash of Corriedale fleece. I have such a backlog of dyed fleece that hasn’t been carded or spun that I’ve pretty much stopped dyeing fleece. But it was already scoured, and I hate to waste color…. Plus, I have actually been chipping away at carding that huge back-log during the spinning and knitting nights at Sheep and Shawl in South Deerfield (Liz Sorenson’s inspiring local fiber enterprise). 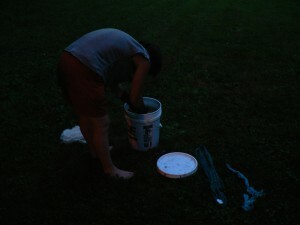 Here I am desperately exhausting the vat in the dark, about 10 hours after I first started in the morning.